If there is someone in your life who was diagnosed with Down syndrome, you already know that the differences are minor and there really are no limits. Yet, you may also feel that others around you just don't get it. You may be frustrated by the ignorance that comes from a lack of understanding. The first step toward making a change is to get a conversation started. 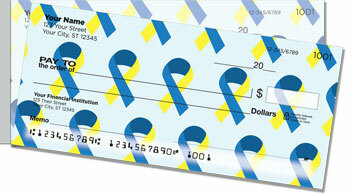 These checks, featuring the Down Syndrome Awareness Ribbon, are an excellent way to do just that. Don't be afraid to tell the world how amazing people with Down syndrome can truly be. 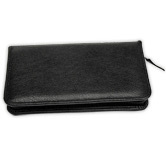 This product is a smart choice because of the easy-to-use, side perforation. 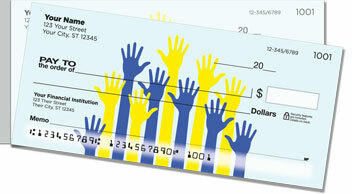 You checks will pull from the pad without those annoying rips and wrinkles. 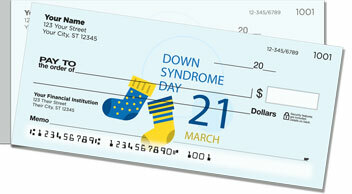 Get your very own Down Syndrome Awareness Side Tear Checks now! 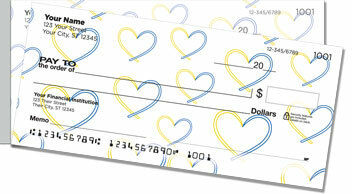 Order today with matching return address labels.